↑ Gray H. 4c. 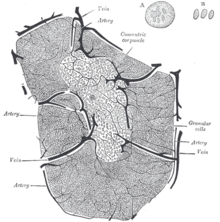 The Thymus // (bartleby.com) Anatomy of the Human Body. — Philadelphia: Lea & Febiger, 1918. ↑ Hussain, I., P.H. Win and S. Guduri (February 2, 2006). "DiGeorge Syndrome". eMedicine. Retrieved 2008-09-29.